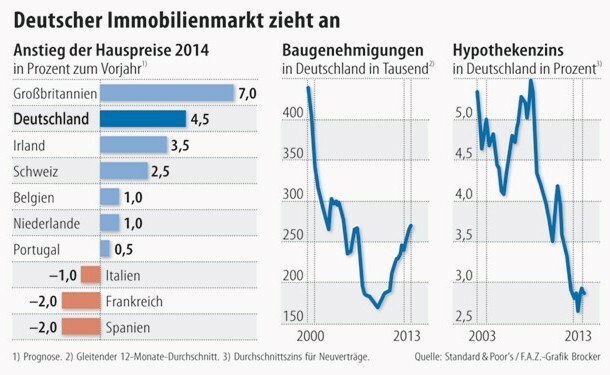 Standard & Poors reports that the prices for real estates will increase in 2014 in Germany. In other european countries like France and Italy there will be no turn. But since 2010 the housing prices in German cities, especially for condomiums are increased by 20%. In 2013 the prices for condomiums in Hambnurg, München, Köln, Frankfurt, Stuttgart, Düsseldorf and Berlin are increased by an average of 9% the German Central Bank announced in it’s monthly report in February 2014. The German Central Bank warns for a real estate bubble in the large cities of Germany. The real estates there are overvalued by 25%, so the German Central Bank. But Standard & Poors say, that there is no bubble in sight because before that increase there was a decade of stagnation. Also the development of the british housing market is seen as brisant. More and more are warning for a bubble, because the prices increased very much the last years. The most mortgages in England have a variable rate, so that many houseowners could struggle, if the Bank of England increase the rates for the mortgages. Tfhis could be possible because of the economic upturn on the island. Due to that risk the Bank of England simulate a collapse in housing prices by 35% in it’s stress tests. Experts say, that this stress test could be difficult for Lloyds and Royal Bank of Scotland, because they have a lot of mortgages based on real estates in their books. Also the other bank supervisors of EU will simulate collapses of housing prices by 19%. Target is to find out lacks of liquidity in simulated situations. In Germany the increase of the prices for construction is minimal. In May 2014 the prices incereases 1.7% year to year. The prices for shell construction increases by 1.4% and for lining the prices increases by 1.9%, both in May 2014 year to year. Prices for upgrading houses increased by 2.2% in May 2014 year to year. Also the netto rents increased by 1.6% in December 2013 year to year. But in Ireland the housing prices decreases between 2007 and 2012 about 50% and are recovering now. In Spain the real estate loose 30% worth still loosing worth now. The economy in Ireland is still recovering. The demand is still very high and therre are only a few objects to buy. Especially in dublin the prices are rising very fast. In a report n-tv warns for the beginning of a new housing bubble. But both countries could be a worth to think about a real estate investment. The USA has overtaken Saudi Arabia and Russia in it’s oil output as the shale Rock oil output recovers the US economy. The USA will stay the world biggest oil producer until the end of 2014, IAEA forecasts. The daily oil output exceeds 11 mio barrels a day in the first quarter of 2014. 2010 the USA is also the world largest gas producer. The IAEA said that that the USA was also the biggest oil and gas producer in June 2014. The USA are the world biggest energy supplier now. “The U.S. increase in supply is a very meaningful chunk of oil . The shale boom is playing a key role in the U.S. recovery. If the U.S. didn’t have this energy supply, prices at the pump would be completely unaffordable.”,” Francisco Blanch, the Bank of America head of commodities research, said. According to IAEA forecast will the USA surge it’s output of oil to 13.1 barrel a day in 2019 and plateau thereafter and lose it’s ranking at biggest oil prducer at the start of 2030. At the result the oil price will be affordable reaching a maximum of 115 $ /barrel. The political situation in Lybia and Iraq has reduced oil production as Nigeria exports has been reduced by oil theft and sabotage. Unitl 2006 Russia and Saudi Arabia were the leading Energysuppliers globally. But the instability of North African and Arabic region will provide the primarily role of the USA. So the forecast of oil prices are very uncertain and can differ significantly from the forecast. So why don’t the governments invest more into green technology projects like solar, wind and water plants like DeserTec or all the possibilities of decentralized power generation? The development of one project belongs ten to 15 years or longer. That means, if we begin to built a plant now the project will be finished in 2030. There are many roofs without panels. And many other possibilities are unused in the pigeonholes of the companies. In the year 2030 the USA will decrease it’s oil output significantly, the oil price could explode. Then the consumers have to pay the default.